B-cell lymphoma/leukemia 11B (BCL11B) is a C2H2-type zinc finger protein and is closely related to BCL11A, a gene whose translocation may be associated with B-cell malignancies. The specific function of this gene has not yet been determined. Two alternatively spliced transcript variants, which encode distinct isoforms, have been reported [provided by RefSeq]. 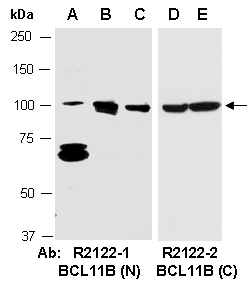 Rabbit polyclonal antibodies were produced by immunizing animals with GST-fusion proteins containing either the N-terminal [BCL11B (N) (R2122-1)] or the C-terminal [BCL11B (C) (R2122-2)] region of human BCL11B. Antibodies were purified by affinity purification using immunogen. Abs against 2 distinct regions of human BCL11B at RT for 2 h.